Some fascinating windmill designs courtesy of the original artists and their publication or patent drawings. Scale and semi scale cad drawings are still in process and will be offered for sale when complete which will include both vertical and horizontal varieties. My 2018’s model is of a 1899 BattleAx windmill based on a design found in the book “Homemade windmills of Nebraska 1899” Battle ax windmills. This particular windmill was designed to be mounted on a short tower on top of a building eliminating most of the tower and because it is non wind direction sensitive. The author makes mention of a furling mechanism but no other details are supplied. My model has 50mm diameter sails and they start rotating under light wind. It is a very interesting windmill to watch. I am currently working on a 12” sale version of that battle ax design for a customers. It will be made of wood and metal. Windmills and Wind motors originally published in 1910 by F.E. Powell. An early image with the start of the saw mill assembly. 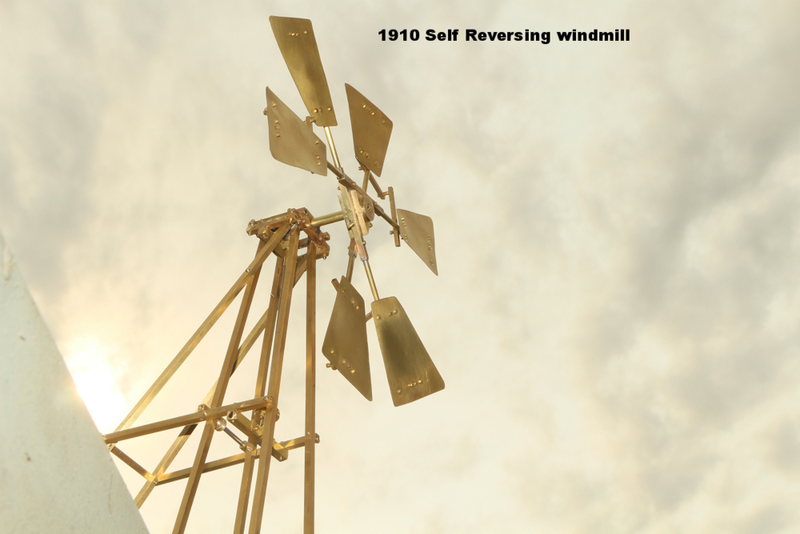 Watch for my latest book on old windmills designs.